The device is capable of generating electrical energy of up to 5 kilowatts and can supply a house's need for heating and cooling. It converts humidity and its energy in the air into water and electricity. Today's advanced technology methods want to redefine energy. New concepts, such as energy mining and the "internet of energies," have come to the agenda. The purpose is to make people produce their own energy by transforming elements that exist in nature. It is hoped that this situation can reduce the amount of energy that a country is dependent on, especially in Africa, and can produce their vital needs at a minimum cost. With this perspective in mind, alternative energy conversion techniques are being developed for solar, wind and gas energies around the world. A Turkish initiative has also developed a device that can produce water from moisture and heat changes in the air. 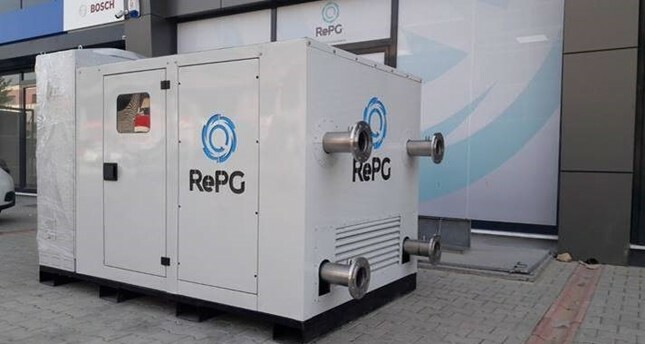 Hüseyin Karayağız, the chairman of the executive board at this initiative RePG Energy at Istanbul Technical University (İTU) ARI Teknokent, says that this device, which is in the beta phase, can convert the relative humidity of air into water and, if desired, electricity with a method tried for the first time in the world. Hasan Ayartürk is RePG's general manager and an inventor who has been thinking about thermodynamics for 25 years. After he saw some water poured onto the street evaporated in the summer when he was in high school, he said, "Is the total opposite possible? Why not?" Ayartürk thought and then adapted his thermodynamics works into a device. He explains the method used in a simple way: "This technology produces water and electrical energy by using the difference appearing due to humidity and temperature changes in the air for 24 hours. We use the difference in temperature and humidity in a day the way wind energy uses energy from the air. This machine has industry, housing and electric types. It can convert humidity in the air into water and also turns the energy of humidity and temperature in the air into electricity." Saying that there have been technologies producing water from solar energy and sea water so far, Ayartürk noted that these energies are not profitable for industrial and personal use in city life. "There are systems in Africa trying to produce water in the middle of the desert. However, it is very expensive. They can produce only 1 liter of water for TL 150,000 per hour. As many charities fund these kinds of technologies, these systems are presented in various parts of Africa. In different geographical environments in the world along with the desert, both electricity and water in an area the size of a room can be produced by using solar panels. But it is also very expensive to install this system. In addition, there are systems for water production from the sea. It also has some trouble such as electricity, money and seawater transport from the seashore. That is if you look at it from an entrepreneurship and social entrepreneurship dimension it is not profitable in any way. On the other hand, it is something from which states and the public should benefit. With $100 billion, you can solve all water problems in the world at one time. You can purify water from the sea around Africa," he continued. What does this device look like? Can a family living in an apartment have this system? Ayatürk explains: "There are energy and water production values according to the seasonal conditions of the weather. The average electricity consumption of a family paying TL 100 is 500 watts. This is a device capable of generating electrical energy up to 5 kilowatts. In addition, you can supply your home's need for heating/cooling by connecting this device to the combi boiler, if you have one, or your air conditioning system. While the system is working, it spreads heat to outside as waste energy and also takes heat from the environment. The heat it takes in can allow cooling by air conditioning, and the heat it spreads is strong enough to heat a house. Our system produces energy if there is a difference in air and humidity like how solar panels produce energy when it sees the sun. If there is no difference, the system stops and continues production when the difference occurs. You can switch from water production to electricity production at any time. You can also do it through your mobile phone. For example, you can organize it to produce water with moisture when you are asleep at 2 a.m. You can arrange it in a way to produce what you need." - This device's method is to use energy in nature and can be explained with a simple example. Salt left on the table at night gets wet in the morning. Because it soaks up moisture from the air. When this is done for 24 hours, the humidity in the air is continuously lowered. Hence, the device is constantly rotating humidity to produce both energy and water. - After taking moisture from the air, there is a need for the energy to turn it into drinking water. Instead of using this energy from the network, this system produces energy with the water taken from the air. - With an application on your mobile phone, you can arrange the device to produce water at 2 a.m. when you are sleeping. Since the device produces in a variable manner, it can automatically start to use energy from storage when the electricity in the house is insufficient or can store the energy that it additionally produces. Therefore, it minimizes the use of electricity. - The system costs can break even in two years for a single house.